In 2012, 30% of all fatal accidents were caused at least in part by a speeding driver, according to the U.S. National Highway Traffic Safety Administration. More than 10,200 people died as a result of those speed-related accidents, which represented an increase of 2 percent from 2011. In short, speed kills. One of the reasons for so many fatalities is that the driver erroneously believes he has the skill to control a powerful, fast moving vehicle. Some people choose their cars based on the power and size of the engine, mistakenly believing that they have the skill to maintain control even at high speeds. As evidenced by the numbers, however, they often find out too late that they’ve made a deadly mistake. Knowing exactly what to do after a car accident is critical, but avoiding one in the first place is even more important. The first step to avoiding an accident takes place before you even get behind the wheel. When you consider your next vehicle purchase, think about the engine size and make an informed decision about just how much power you really need (and can control) under the hood. Knowing the difference between a 4-cylinder, a 6-cylinder, and an 8-cylinder engine, and being aware of your own driving abilities, can literally save lives. Is There Much of a Difference Between a 4-Cylinder and a V6? The two most common engines in the United States are 4-cylinder and 6-cylinder engines. The smaller of the two, the 4-cylinder, is generally configured in straight lines. 6-cylinder engines, on the other hand, are usually in a “V” shape, which is the reason why they’re called V6 engines. Historically, the more cylinders an engine has, the more powerful it is, and the less economical it is to drive. After all, more power requires more gas. For that reason, drivers who prefer economy over power have opted for vehicles with 4-cylinder engines. However, recent advancements in both fuel economy and engine efficiency have closed the gap some. Auto manufacturers have worked tirelessly to improve the efficiency of the V6 engine so that it is now closer to the 4-cylinder relative to gas mileage. They’ve also worked to improve the performance of 4-cylinder engines. However, even though some 4-cylinder engines can now hold their own against a V6, for the most part, V6 engines are still more powerful. So, if you are choosing between two cars, one with a 4-cylinder engine and one with a V6, and you’re a new driver, or are otherwise concerned about your ability to control a more powerful vehicle, consider the car with the 4-cylinder engine. Cars with smaller engines generally cost less, too. 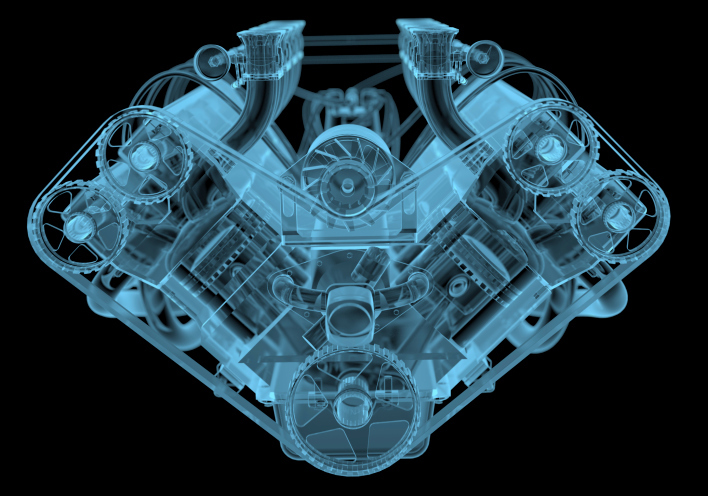 The “V” configuration of a V6 engine is there for a reason. It’s designed to separate and balance the cylinders into what are called banks. It’s a critical component of the engine’s design because the power of so many cylinders working together requires that its force be counterbalanced with equal forces. Without that balance, an engine could literally shake itself apart. The same is true for a V8 engine. While the V6 is balanced best when the V is situated at 60 degrees, the V of a V8 engine needs to be at 90 degrees. Most vehicle engines come with either 4 or 6 cylinders, but some trucks and many sports cars are equipped with a V8. Even as manufacturers continue to close the gap on performance between the engine sizes, it should still be a top consideration for new drivers and those who aren’t comfortable with handling more powerful vehicles. If you fall into one of those two categories, consider a car with a 4-cylinder or even a 6-cylinder engine instead of the heavy duty V8 engine. When you purchase a car that has less power, it will cost you less, you will save money on gas, and you could possibly save lives.